Richard Stark fans will relish heistmeister Hobbs, an older Parker in everything but name, as he struggles to pull off one last job in this well-plotted tale of robbery, murder, and revenge. The swift-moving action builds to a satisfying denouement. An extraordinarily dark, twisting noir novel with crackling dialogue and action, featuring an aging anti-hero who should be checking out the Early Bird specials at a local restaurant, but instead is on a blood-soaked mission of revenge. Highly recommended… and you’ll never look at an AARP card the same way again. A thoroughly engaging anatomy-of-a-heist style crime novel. Hobbs is wonderfully gritty and irascible, an old school pro, and yet charming in his own hard-boiled way. Fast and brutal, gripping and ingenious, this tale of an analogue thief in a digital age had me locked in from page one. Stephen Gallagher, author of "The Bedlam Detective"
Scott Phillips, author of "The Ice Harvest"
An all-around great read. A gritty, hardboiled caper for the old and the old at heart. Christa Faust, Edgar & Anthony award-nominated author of "Money Shot" and "Choke Hold"
Patrick E. McLean succeeds with his foray into crime fiction. 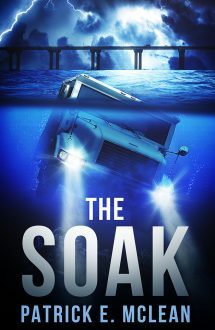 Is THE SOAK the first title of a series? We can’t help but wonder if we’ve truly seen the last of this aging but enduring character.